This year, following a year-long battle with Hiddush, the Chief Rabbinate updated its kashrut regulations to be in accordance with the law. Everyone that has heard of this change has viewed it as revolutionary and a sea change. 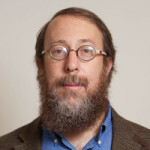 It comes after decades of religious coercion, and it is important for us to make clear that the intention of Hiddush’s initiative was not to prescribe the use of musical instruments, recorded music, photography, etc., on Shabbat, but rather to remove the Rabbinate’s illegal prohibitions, and make it possible for individuals and groups to choose how to celebrate their Shabbat rituals and oneg Shabbat in meaningful ways. 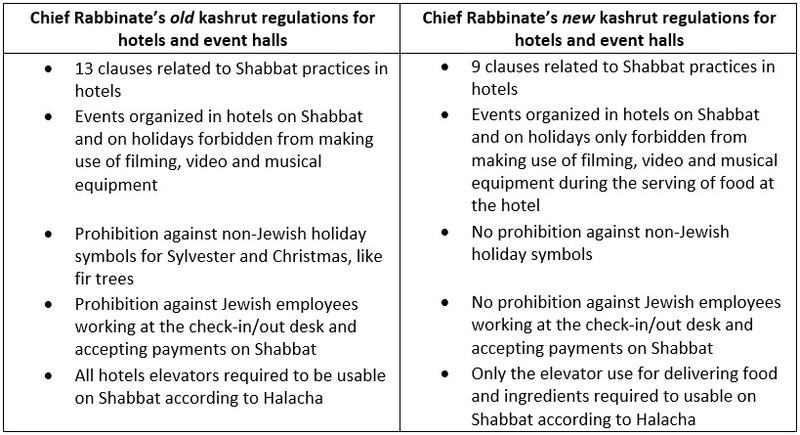 Unfortunately, the Chief Rabbinate long extorted the hotel establishments, using its monopolistic authority over kashrut to force the hotels and event halls to comply with its Shabbat standards and anti-Christian sentiments. The reason we share this information at this time is the realization – after receiving calls from a number of hotels and tour operators, as well as colleagues who brought groups to Israel over the summer – that the Rabbinate hasn’t quite “internalized” the new rules. In fact, they are doing everything in their power to prevent their implementation. Hiddush will take further action, vis-à-vis the Rabbinate, the Ministry of Religious Services and the Attorney General’s office to convey the binding nature of the new rules, but it’s clear to us that the most effective avenue for bringing the new rules to light, and enabling colleagues who wish to celebrate Shabbat services with guitars (for example) in hotels on Shabbat, is to actively mobilize our colleagues. We ask that those colleagues who have encountered problems share the details of their encounters with us, and colleagues who are planning future trips should convey to their tour operators and hotels what their intentions and expectations are, as to the use of music, photography, video projection, etc., as part of their Shabbat programming. As you may imagine, the hotels are eager to see this change, making it clear that the current policy of the Rabbinate seriously hinders their ability to serve groups and potential groups (such as Israeli labor union groups) who decide, for instance, not to come to Jerusalem because they are curtailed in their weekend programming. 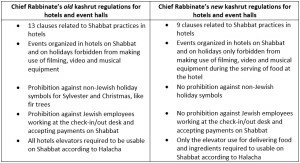 Without counter-pressure from clients, the hotels may not be able to effectively push back against the ongoing pressure from the Rabbinate. Individual colleagues with whom we had contact and briefed on the new guidelines were both appreciative and enthusiastic. This is one more example of RRFEI’s importance, to broadly share relevant information with our colleagues. 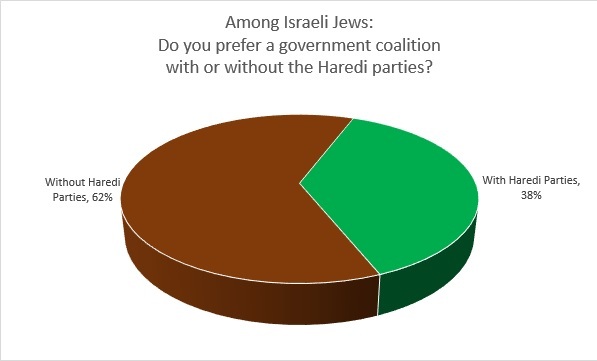 Hiddush’s 2014 Israel Religion and State Index is now available here under resources. Media coverage on Hiddush’s victory against the Chief Rabbinate’s illegal kashrut regulations for hotels and event halls is now available here under resources. Please contact RRFEI or register to join Rabbis for Religious Freedom and Equality in Israel.